A short walk on Malling Down, above Lewes, with grand views over the surrounding area and Malling Nature Reserve, also visiting the Martyrs Memorial. 1) Leave the station by the exit on platform 1. Walk ahead through the car park and then turn right along a lane. At the end of the lane turn right onto Friars Walk. Go straight ahead at a mini roundabout to reach some traffic lights. Turn right here into the pedestrian precinct. Continue straight ahead as far as you can, crossing the river bridge and walking up Cliffe High Street. 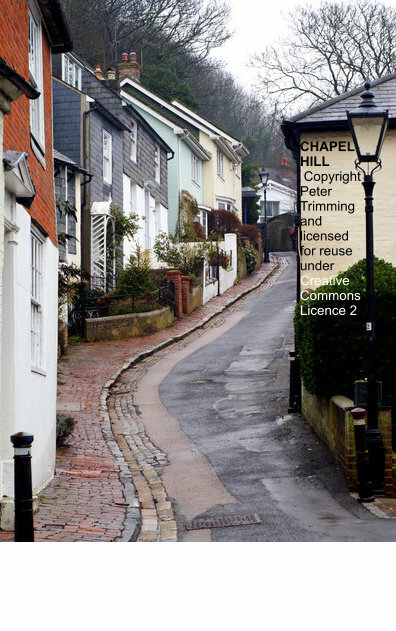 At the end of the High Street walk straight ahead up Chapel Hill, which bears right and climbs steeply. Look out for a footpath on your left. It is indicated by a post on the right with a yellow arrow. Turn left here. Then turn immediately right. Do not go straight ahead into the Culfail estate. Follow the path up to the golf course. At the edge of the golf course turn left and walk along its boundary, past the Martyrs’ Memorial on your left. Reach the corner of the golf course. Turn right here and walk uphill with the golf course on your right. and a hedge on your left. Just before some trees turn left through a gate to leave the golf course and join Malling Down nature reserve. 2) Pass through the gate and turn immediately right. Follow the path up hill, keeping next to the fence. This is an awkward path through trees. It often slopes which can make keeping your balance difficult. Come finally to the end of the trees and a grassy track that bears off to your left. Your climbing is finished now and you can enjoy the wide ranging views. There is a seat which you can rest on. Follow the track downhill through a gate and continue to follow it as it bears right, continuing downhill. 3) Go through the gate and turn left at a junction almost immediately afterwards. Descend behind houses to a green open space. At the open space continue in the same direction, along the line of the trees to reach steps down to the road protected by metal bannisters. At the road cross with extreme care. This is a busy road and there is not much room to stand. At the other side turn left and walk past an office block, a a garage, houses and the Culfail Tunnel, following the main road. Keep straight ahead at a roundabout. Walk past the Tesco filling station. Just after this and before the river turn right on a path which descends to the riverside. On reaching the river turn left under the road and follow the path which turns first left and then right. Then keep straight ahead, keeping Harvey’s Depot on your right. Pass through a passage. At the end of this turn right. You are now in Cliffe High Street and can return the way you came. However you may wish to sample the many cafes and pubs in the High Street first. Cliffe prides itself on being separate from Lewes. Traditionally the area to the east of the river came under Canterbury Cathedral, whilst the west of Lewes came under Chichester. Cliffe bonfire society is the most militant of all the Lewes Bonfire Societies. Plenty of handy shops, cafes and pubs. Look out for Harvey’s Brewery (the cathedral of Lewes) and the characterful Gardeners Arms. As a site celebrating the Lewes Bonfire tradition puts it, the “Protestant Martyrs Memorials, stands on the Cliffe Hill, Lewes. It is a simple dignified obelisk, 35 feet high, and can be seen for a considerable distance. It cost about £900. Since its unveiling by the Earl of Portsmouth in 1901, with the exception of about three years during the war, an annual commemoration has been held at the foot of the memorial. On the monument it states that it is erected in loving memory of the Seventeen Martyrs (whose names are recorded) who for their faithful testimony to God’s Truth were, during the reign of Queen Mary, burned to death in front of the Star Inn, now the Town Hall, Lewes. The reserve is maintained by Sussex Wildlife Trust and has many typical and rare flowers and butteflies. Our walk goes around the high lands in the reserve, with grand views to the west, but the bottom of the reserve is also worth exploring.